Welcome to the general dentistry practice of Dr. Brad Jones. Here we strive to establish trusting relationships with all of our patients as we work together to provide excellent care in a comfortable, relaxed setting. We accept patients of all ages, and our professional team will focus on your individual concerns and needs as we establish a diagnosis. We listen closely and want you involved in all treatment decisions. Our goal is to provide you with dental care that lasts a lifetime. From preventive or cosmetic care to advanced dental reconstructions, we are prepared to help you reach your own goals for dental health whenever you are ready. 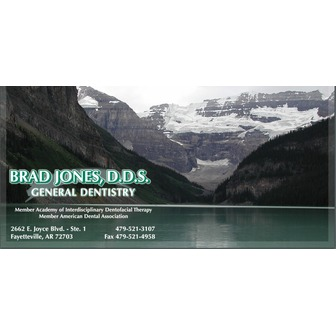 Dr. Jones did undergraduate studies at Baylor University and received his Doctor of Dental Surgery degree from Baylor College of Dentistry in 1983. A native of Arkansas (Pine Bluff) he returned to his home state to become a Dentist in Fayetteville AR the same year. He is a member of the American Dental Association, Arkansas State Dental Association, and the Academy of Interdisciplinary Dentofacial Therapy, where he has served as past president. In addition, Dr. Jones has received certification in Conscious Sedation techniques and maintains membership in DOCS education (www.SedationCare.com) in order to stay current. He has been published on interdisciplinary concepts in restorative dentistry and actively practices the philosophy of interdisciplinary care for the optimum care of patients. In the arena of continuing education, he is an avid student, advancing his knowledge and skills in all areas of cosmetic and restorative dentistry through advanced course study. As well as maintaining a full time practice, Dr. Jones devotes significant time to the development of an electronic medical record (EMR) system with US Health Record, a cutting edge company that has been providing internet-based dental records for over ten years. He currently serves on the Dental Advisory Board of USHR and helps in the ongoing development of the TeamLinks collaborativesoftware that powers the virtual, cloud-based charting program.